Make a deal with us, and I won't hit you with tariffs. That was President Trump's message to Canada and Mexico Monday morning as all three countries began to conclude a round of NAFTA negotiations in Mexico City. Tariffs are Trump's latest negotiating tactic to make Mexico and Canada accept his demands on NAFTA, the three-nation trade deal. Last week Trump said he will impose tariffs on imported steel and aluminum from all countries. Over the weekend, his advisers confirmed that no countries are expected to receive exemptions from the tariffs. Experts say Trump's tariffs could hinder an already difficult NAFTA renegotiation process..
"This makes it quite difficult politically for the negotiations to move forward," says Michael Pearce, an economist at Capital Economics, a research firm. "It's quite a significant barrier to any progress in the talks." News of the looming tariffs didn't go over well with Canada and Mexico, which are among the top steel exporters and importers to and from the United States. That integration is thanks in part to NAFTA, which became law in 1994. "Should restrictions be imposed on Canadian steel and aluminum products, Canada will take responsive measures to defend its trade interests and workers," Canadian Foreign Minister Chrystia Freeland said in a statement. 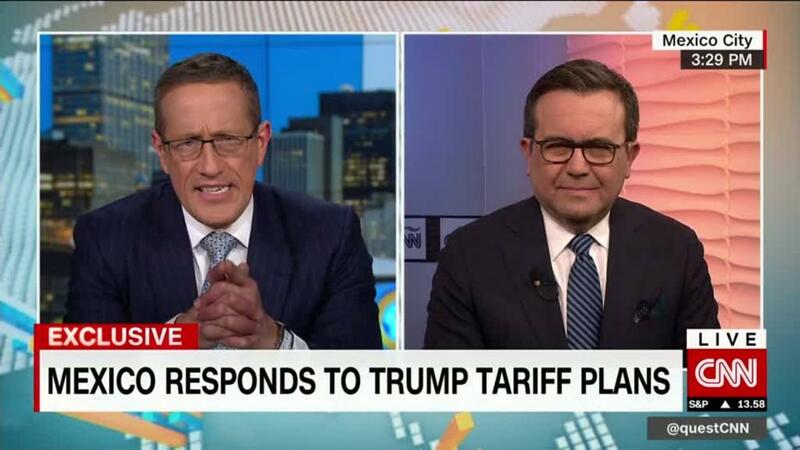 "Any measure that will not exclude the North American partners will have tremendous consequences on how we're integrated," Mexican Economy Secretary Ildefonso Guajardo told CNN's Richard Quest Friday. All three countries have been mired in trade talks since last August that were sparked by Trump's insistence that NAFTA has been a raw deal for American manufacturing workers. Canada and Mexico argue that NAFTA has benefited each country. Round 7 ends Monday, and NAFTA's future was already facing uncertainty and doubt. Economists say the most likely outcome is that talks get kicked down the road to 2019, but they don't rule out a U.S. withdrawal, which Trump threatens to do. So far, no progress has been made on divisive issues, such as auto manufacturing. Time is also running out for a deal to get done anytime soon. Campaigns for Mexico's presidential election in July officially kickoff in a few weeks, and Mexican leaders have long warned they can't ratify a new deal in an election-season environment. Plus, the frontrunner in polls, Andres Manuel Lopez Obrador, says he would restart talks all over again if elected. The next president won't take office until December, and President Enrique Peña Nieto can't run for re-election due to term limits. Then there's US midterm elections in November. Republicans on Capitol Hill have implored Trump not to tear up NAFTA or impose the tariffs. Some are already distancing themselves from Trump. "If the president goes through with this, it will kill American jobs -- that's what every trade war ultimately does," Ben Sasse, a Republican senator from Nebraska, said in a statement Friday. Correction: A previous version of this story incorrectly stated when Round 7 of NAFTA talks concludes. Round 7 ends Monday.